Observe below input files data. Here Row 3 - Column 2 is not matching so the two excel files are not equal. Desari Srinivas, is this project available for reuse? That is, do I have permission to use it and/or edit it? Thanks you Srinivas.... This code helped me a lot !!!!!!! Can you please tell me how to return the entire row if there is a mismatch in a particular cell in that row ? hi srinivas, i have a similar requirement with small change. Requirement is that "have to compare two rows from sheet1 and sheet2 but it should not be in order. Means if i say 1st row in sheet 1, presents in sheet2 as row 10 but both are equal". so here comparison logic would be take 1st row from sheet1 -> compare with all the rows in sheet2 one by one until its get matched. if matches then say row1 is matched or say failed. Can you help me here, Please. Thanks in advance. so here comparison logic would be take 1st row from sheet1 -> compare with all the rows in sheet2 one by one until its get matched. if matches then say we need to change the Font of matched row to GREEN in anyone excel sheet and if it does not matches then change Font to RED in the same excel sheet.Can you help me here, Please. Thanks in advance. I see some conditions. To understand the algorithm, I found several tutorials, perhaps this will be very useful for those who do not finally understand the sorting, and how I search for explanations. getCellType is deprecated .How do I modify it? 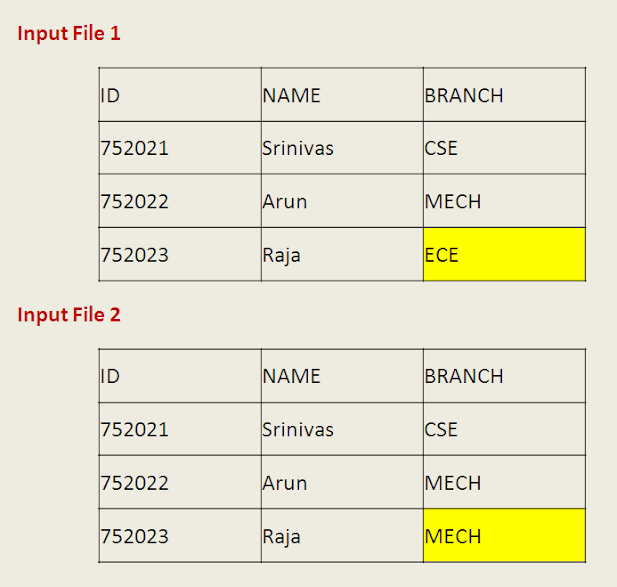 Compare two excels files and if we find any differences in one excel sheet that difference or row should be added in a given excel path and after adding the differences in that excel it should get highlighted ? Is it possible to add automatically ?